Avery Elle: Introducing Let It Snow, Build A Banner & Thankful!! Introducing Let It Snow, Build A Banner & Thankful!! Today I have some previews of three of our new sets that will be available for purchase this coming Thursday. I am very excited to finally be able to show you what we have been working so hard on. Use our 4" x 6" Let It Snow clear stamp set to stamp a cute winter scene. This cute stamp set is perfect for the winter holiday season and is one that you will reach for over and over. We tested every major manufacturer to find what we consider to be the best clear stamps in the industry. We find our photopolymer stamps are clearer, require little conditioning, stamp smoother and crisper using various ink types. Even better, our high quality cute stamps are made in the USA. Tree image measures: 2 5/8" x 5 5/8" ; Large bird measures: 3/8" x 7/8"; All Is Calm, All Is Bright sentiment measures: 1 1/2" x 1 1/2"
This next set came about when Heather Campbell emailed me with an idea to create a build your own banner set that could be stamped in two different colors. I thought it was a brilliant idea and our new Build A Banner stamp set and coordinating dies are a result of our collaboration. 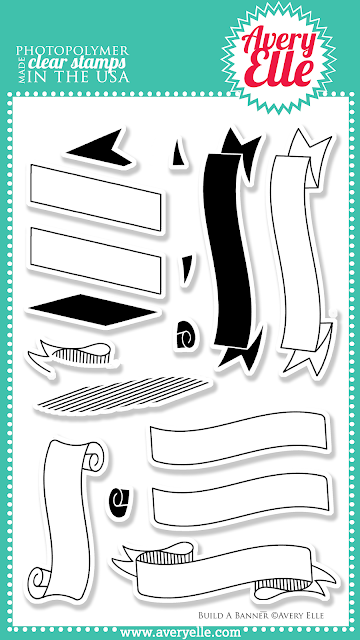 Our 4" x 6" Build A Banner clear stamp set is perfect for creating two toned single or double layered banners. Stamp the banners first and then the tails in a complementary color to create a custom and layered look. Use these banners with our Build A Banner Elle-ments steel dies to create professional results. Single Scroll Banner Measures: 1 7/8" x 3/4" ; Main Double Straight Banner image measures: 1 1/4" x 1 1/2"; Main Double curved Banner image measures: 2 1/16" x 1 1/8"; Single Point-ended Banner measures: 2 7/8" x 3/4"
When I was illustrating our next set, Thankful, I wanted to create a cute acorn image that could be used for place cards, tags, cards, etc. I have so many plans for this affordable little set. 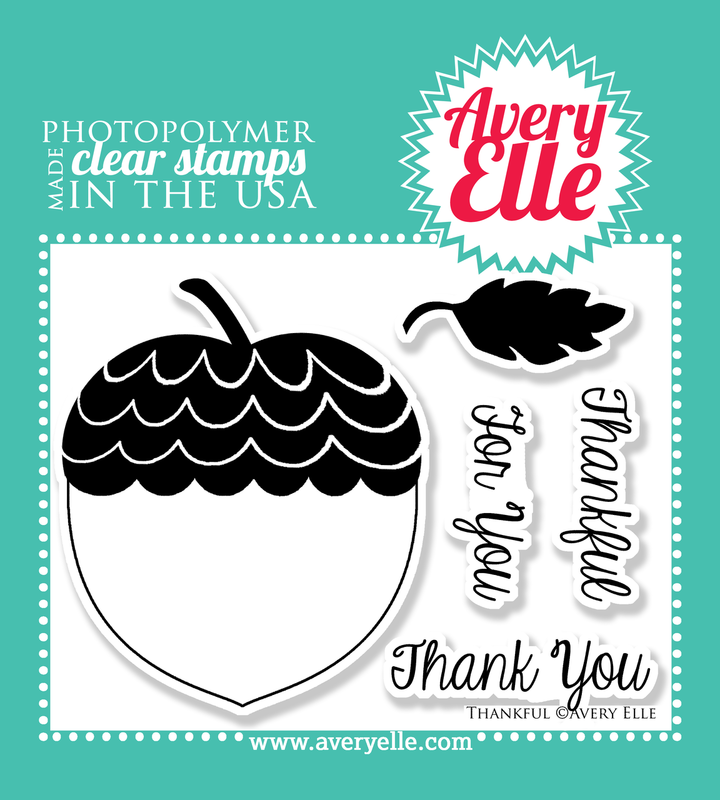 Our 4" x 3" Thankful clear stamp set is perfect for fall. 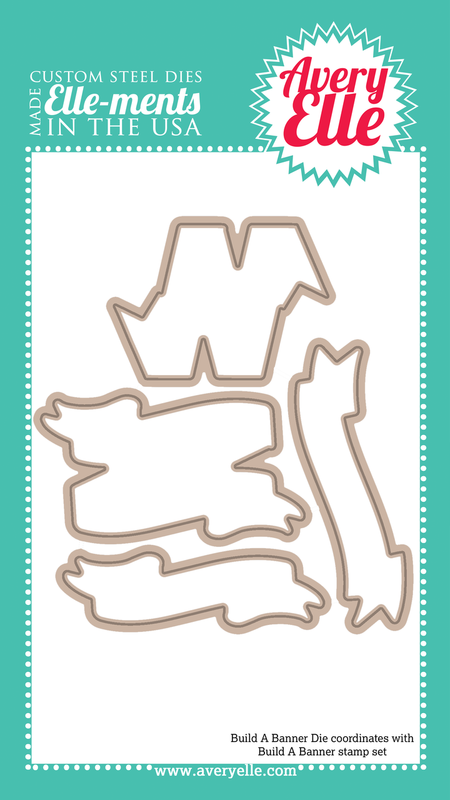 Stamp the acorn image and leaf onto a tag, card or journal card to create a festive look. Measurements : Acorn image measures- 2 1/4" x 2 3/4"; Thankful sentiment measures: 1 3/8" x 7/16"
I hope you have enjoyed what you have seen so far. 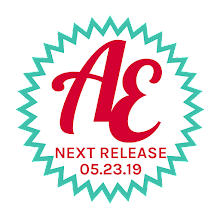 Be sure to stop back tomorrow for previews of three more sets from our newest release. Thanks for stopping by to take a peek. Have a great day! Oh I love these sets!!! The let it snow set is beautiful!!!! I can just imagine the possibilities!! And the build a banner set is awesome an so versatile!! Loving the acorn too!!! How exciting!!!! Can't wait to see the DT's cards!! Ahhhh, you're winning my heart, Avery Elle!!! Can't wait to see what your team does with the banner set. So intrigued. Oh..... the new sets are amazing! LOVE Let It Snow! Wow, fantastic Day 1 Preview! I love the cute little birds and trees in the Let It Snow set. As always the sentiment fonts are wonderful! 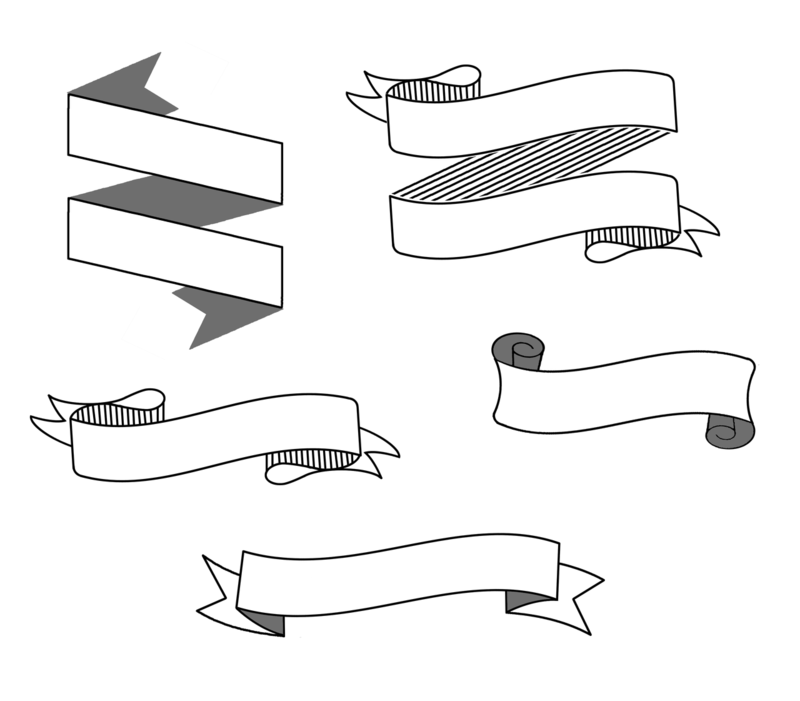 The Build A Banner set and dies are AMAZING, the possibilities are endless! The super cute acorn and sentiments make the Thankful set a must have for me! 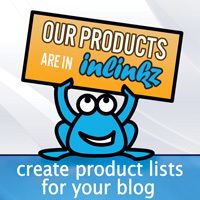 I am eager to see samples and can't wait to see what you have for Day 2! Fabulous new sets. 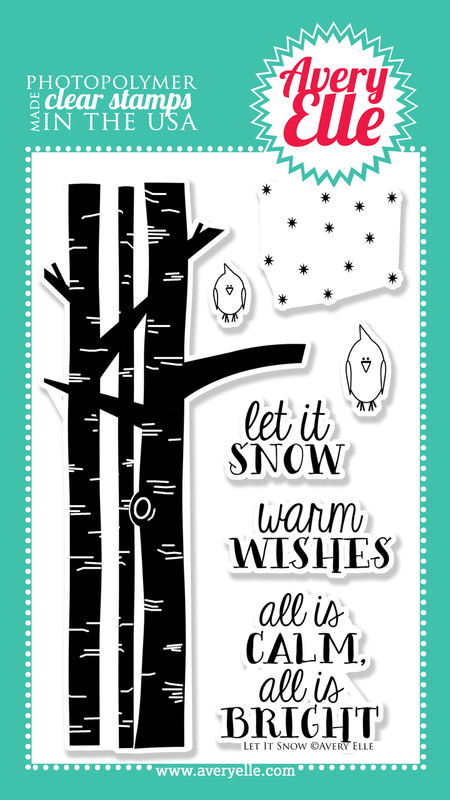 Love the idea of building your own banners and the wintry stamp set is gorgeous. FABULOUS new sets!!! Love them all, but that Let It Snow set has stolen my heart!!!! LOVE the banner set!!! Great idea! These are wonderful sets. Those birds are adorable. TFS. Wonderful sets...am really looking forward to getting my inky fingers on them. I'm totally blown away! These new sets look amazing. Yum! But those trees on the first set are oh so cool. WOW that build a banner is the most amazing stamp and die combination - great idea.